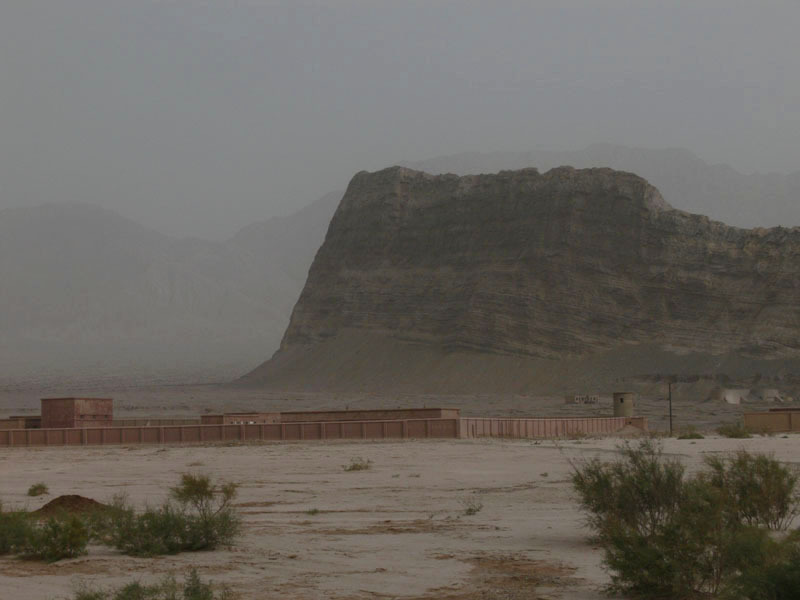 Aksu, the next town we stopped at to have a rest, is one of the ancient places of Taklamakan, where even the headquarters of the supreme regent of Kashgaria Yaqub-Beg were once situated. Aksu population two times odd surpasses that of Korla, and, accordingly, when we were approaching this town our eyes were intensely looking for the proof of its size, which could be many-storied buildings in its center, as in any Chinese town nowadays. However, we did not notice particularly high buildings. The river Aksu (‘white river’ in Turkic) that we saw has lost resemblance with its name long ago. Our further wandering around the town in search of ancient sights led actually to nothing. There were no significant remains of the old town to observe, and that disappointed us a bit. Chinese constitute half of Aksu population; that is why the fact that it was here that we made our deeper acquaintance with the largest in number nation in the world with the help of one of its representatives is somewhat natural. The place to pass the night we sought as usual: if you cycle around the town long, finally you will meet some one who can help you. In Aksu this ‘some one’ turned to be Jiang, a Chinese school teacher who knew English a bit and was crazy about everything Russian. It happened that the very day we met him Jiang celebrated his 24-th birthday. 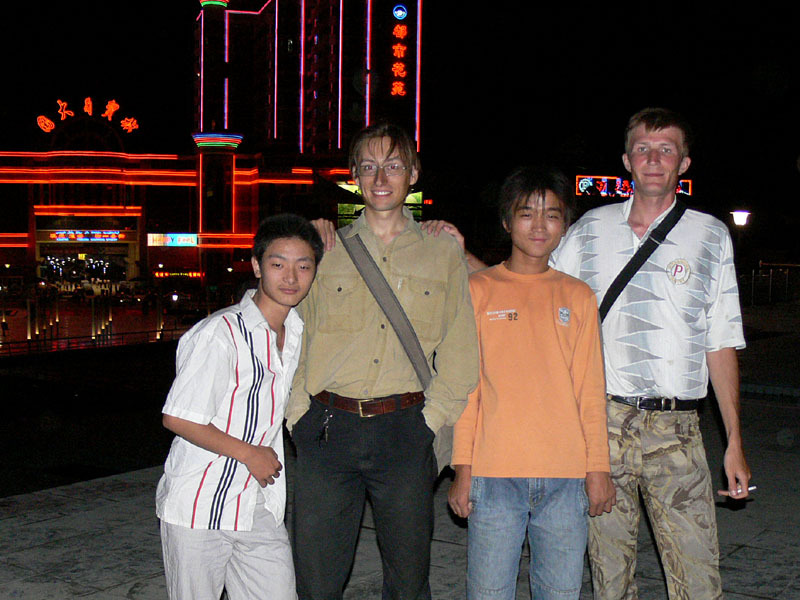 Jiang helped us to find a cheap hotel and spent two evenings with us, telling about Aksu and its inhabitants. He acquainted us with the Chinese cuisine that we had not tasted well before despite we had spent some three weeks in China (pelmeni we ate at U Tua’s restaurant on Korla-Aksu highway cannot be considered, because we will never be able to regard this dish so popular on ex-Soviet space a Chinese one). 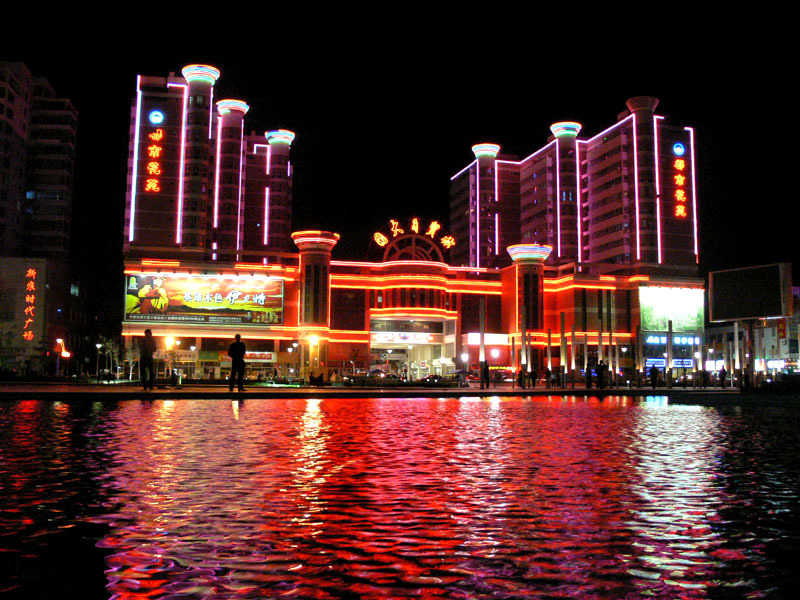 Our friend showed us another beautiful night Aksu: every day at about nine in the evening a plenty of multi-colored lights and highlighted fountains are switched on at the main square of the town, and one can observe such an enthralling sight as dozens of couples dancing round to the slow music. In general Aksu dwellers seemed very communicative and curious people. 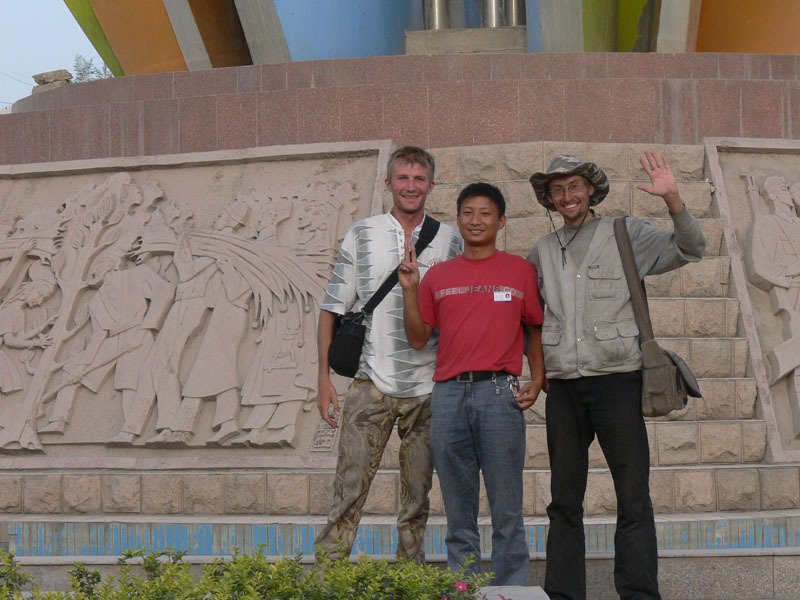 While Jiang, Sanya and I were standing at the square and taking photos, a whole crowd gathered around us. With the help of Jiang or independently people tried to speak to us. At last, it ended by repeated photographing in various casts and changing e-mail addresses. In Aksu Sanya created an impression of a person who knew Chinese. This happened every time in the Internet-cafe when he in the guise of expert set Russian keyboard layout which eased my life much. Actually, the situation with the Internet is fine in China. Good connection with low prices (as a rule, 2 yuans per hour, which is less than 25 cents) let us easily hang out in the Internet-cafe writing travel notes and sending the photographs taken. 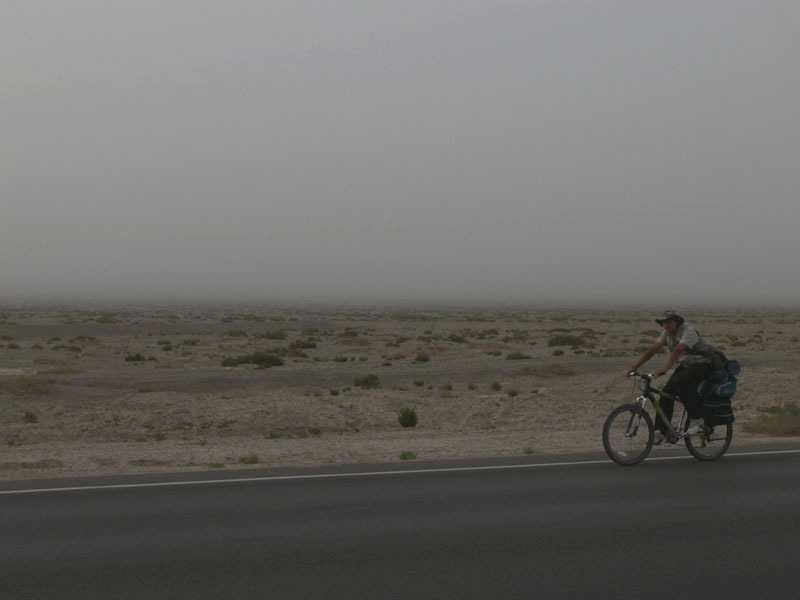 We spent two nights in Aksu, and the dull morning on the next day of our journey we left for Kashgar. Now traffic signs almost always pointed at it, informing us of how many kilometers remained for us to cycle. We are moving now along the same Taklamakan above which ‘dry fog’ is constantly hanging, but the changes in landscape are obvious. 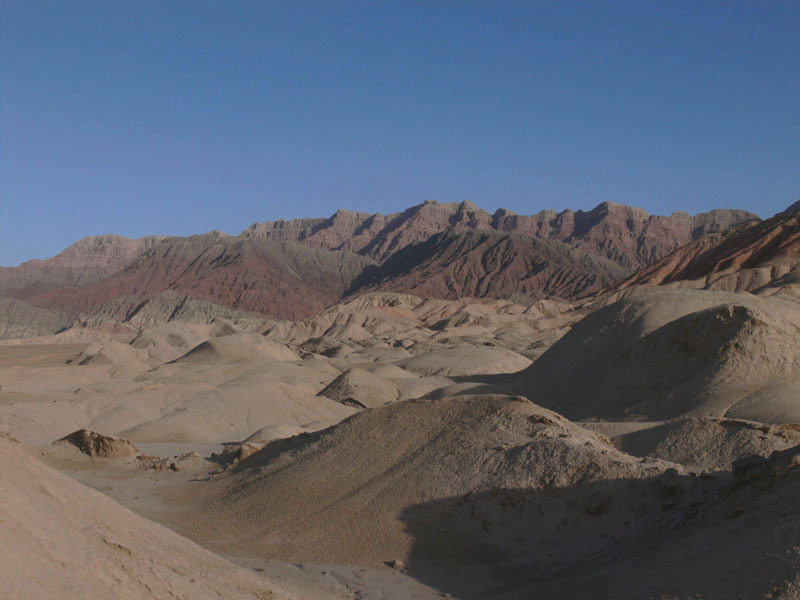 Some 120 kilometers from Aksu the deserted landscape grew more interesting (close mountains tell on it, because the highway goes along the Kelpincheltag range) and contrasting – now the background for rare pale-green bushes is red earth and mountains formed by marsh-green and red layers. Also two days before we came to Kashgar we observed a lake, and could eat fish from this lake in a roadside cafe. Industry in this region of Xinjiang is not as well developed as in the previous part of our way between Korla and Aksu; besides, there are less people there. Maybe that was the reason I liked these places more. The only thing that did not change was that we arouse the same strong interest of the people. It was particularly very interesting to watch numerous roadmen who literally threw their work and stood motionless accompanying us with the gaze. They definitely became the most numerous group of our ‘admirers’. If all roads lead to Rome, then all winds blow to Kashgar, according to Sanya’s choice words. 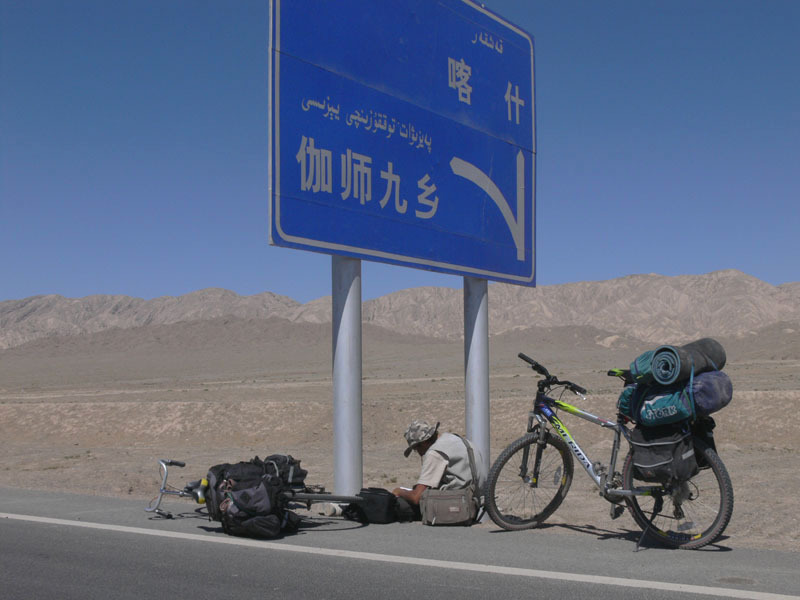 The five days of our moving from Aksu to the destination of the journey passed with a few exceptions with the fair wind that literally pushed us in the back and encouraged our ‘fighting spirit’. 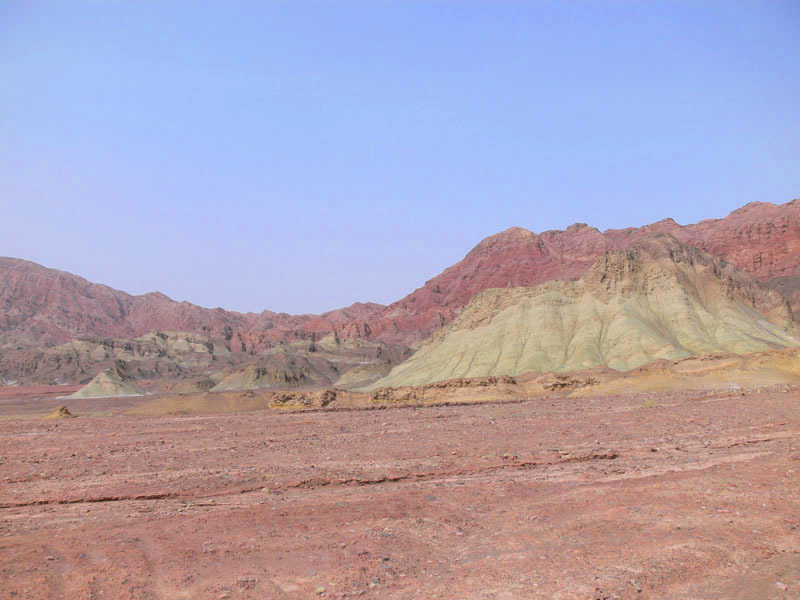 It was especially pleasant to cycle in the evening, when the heat abated and the sun was shining nicer than usually, coloring the desert and mountains on the horizon in colorful tones. When cycling is easy and done without any tension, different thoughts, remembrances, impressions and feelings begin swirling in your mind. I hope that our observations will be helpful for those who will travel around Xinjiang after us or the ones interested in China in general and Xinjiang in particular. China is the country where you feel well the advantages of the bicycle and rather anxious attitude to those who cycle. Surely, no one will let a biker pass (but no one is going to let anyone pass, at best they will drive him around); but the person on a two-wheel vehicle is treated as an equal in rights participant of traffic and not as a hindrance on one’s way. Bicycle paths in cities and wide edges along highways make traffic less difficult and do not create problems and friction between four- and two-vehicles drivers. Chargeable roads, exits and entrances to which we met some six times on our way, are absolutely free for bikers (unless the road is not duplicated by a free one). Languages in Xinjiang are a point of interest. On the one hand, knowing Chinese is important in this part of China as well because usually Chinese and non-Chinese use this language with a few exceptions; on the other hand, there are a large number of people in Xinjiang who speak mostly their native languages (Uighur, Kyrgyz, Kazakh and the others). That is why priorities may vary in different situations and in different parts of the autonomous region, according to the national composition of the population. But what knowing Chinese is extremely needed for is orientation in the locality by means of traffic signs. As there were no Latin inscriptions on them, by the end of our journey we could understand Chinese toponyms fairly good. The point was that names of cities, villages, rivers and so on consist usually of several hieroglyphs (which in this case serve as syllables) and a word (or words) added at the end and denoting the type of the toponym. Comparing Chinese hieroglyphs with the names which were written in Latin on our map, we deduced a simple set of hieroglyphs-syllables that enabled us to know where we were moving – to Aksu or Alar, to Kashgar or Aktash – and how many kilometers are left before our next destination without looking up in the map. Another interesting moment was time. Actually there is single time at China ’s territory (time zone of Beijing, GMT+ 08:00 ), which is two hours different from Astana time. This is definitely comfortable to a certain extent, though for Xinjiang which is objectively situated in another time zone it is not absolutely acceptable. In connection with this there can be observed from time to time ‘actions of civilian disobedience’, such as the clock in a cafe telling Xinjiang but not general Chinese time, or time at some local TV channels which obstinately keep time differing from that of Beijing in 2 hours. The consequence of this is that life in local villages usually does not stop until 11-12 in the evening (which seems logical for it is only 9-10 for those people – too early to sleep!). Showing their dislike to all Chinese and everything Chinese is not occasional among the Uighurs (though it is not a rule). Take for example such a trifle as cigarettes. The opinion on their quality depending on the producer we had to hear out once from an Uighur interlocutor who set at our table, probably to ‘establish cooperation and collaboration between Kazakhstan and Xinjiang’. After our few weeks’ journey around China it was possible to make up some conclusions concerning cuisine. In Xinjiang two cuisines are prevailing, which belong to the peoples constituting the most part of the region’s population – Chinese and Uighur, the latter one dominative. The above-mentioned tradition to put a tea-pot with green tea is widespread everywhere, but further process of serving the dishes and the menu are very different. The names of Uighur dishes were known to us before, but they are pronounced in a bit different way: lagman – ‘lyagman’, pilaw – ‘polo’, manty – ‘manto’ (the stress on the last syllable in all the words). However, to our great amazement beer (pivo in Russian) is the same ‘pivo’. The situation with the Chinese cuisine is certainly not as clear. We would be very happy to see the photos accompanying the dishes in menu, but we did not. Though, thanks to Jiang from Aksu we learnt a simple set of words which let us order food in Chinese eating-places. Thus, we could taste pork with potatoes, chicken (true, it was deprived of the most important in our opinion parts of its body – the chicken legs), the most delicious stewed fish and several soups including fish and noodle soup. And the Chinese for ‘beer’ (‘pee-dzu’ with the stress on the first syllable) we learnt even in Urumqi. 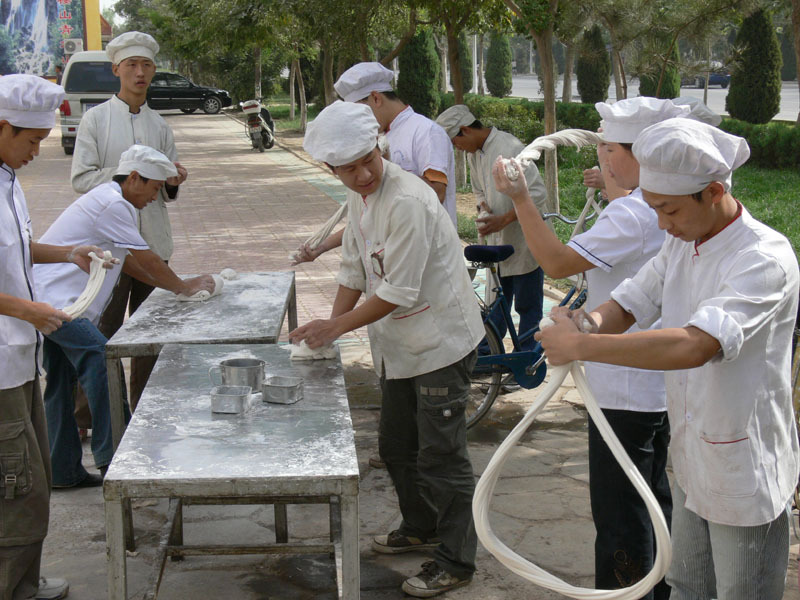 In Uighur cafes there can be bread round-cakes called ‘non’, whereas the Chinese eat rice instead of bread and usually serve it up with any dish. Both bread and rice are often necessary because local food is famous for its extreme pungency. Chinese people, as one should expect, almost always eat with the chopsticks, and only in certain situations use small ceramic spoons in a special shape. The Uighurs have a bit different situation. The chopsticks are also used everywhere, but farther from Urumqi and accordingly closer to Kashgar the possibility grows for you to be given a spoon together with the chopsticks, especially with the pilaw. There are also some differences in serving the dishes. The Chinese usually serve their food in big common dishes, giving each eater small kise-plates, the number of which corresponds to the number of dishes. The Uighurs use a traditional in our opinion method ‘each one has his plate’. Eating time is also different. Uighur meal is eaten much faster than Chinese, because the latter usually requires good mastering the chopsticks (eating rice with them is unlike eating lagman noodles); moreover the Chinese dishes are more complex and are rich in bones. If we began to tell about cuisine, we should mention situations when we cooked ourselves (which usually happened in the evening). By the end of our journey we knew well how to cook in the desert, where it is almost always possible to get material for making a fire and creating a fireplace. The latter is wonderfully made of pieces of ubiquitous takyr (chappy soil), from which you may stack real mini-furnace. The fuel for it can be roots of desert bushes, which are usually dry and thick, inflame well and give good heat. It is obvious that the head preoccupied with secondary thoughts sometime cannot observe the things around as, for example, a tractor loaded with cobble standing on the edge of the road. Such tractor was the one Sanya got managed to run into. He got off with light fright and bent brakes, though. 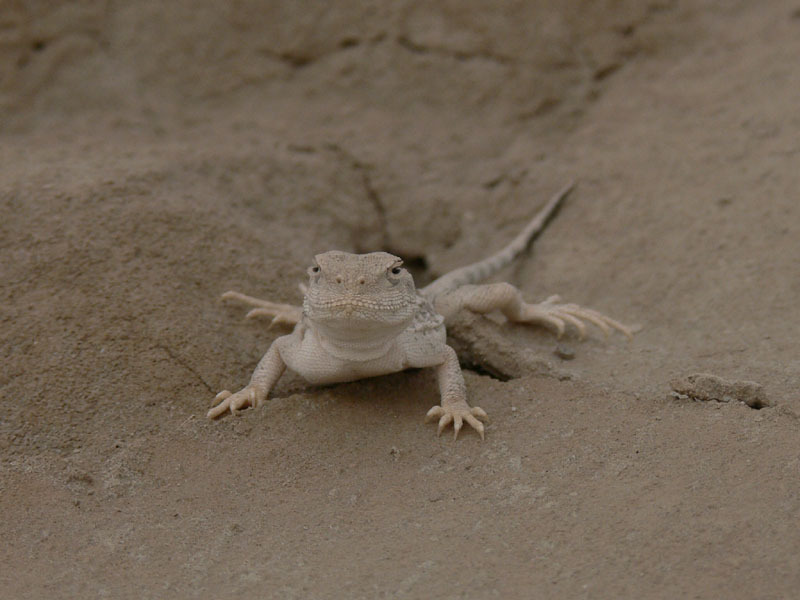 As it turned out (though it was difficult to believe in that), he just did not notice it, as if he wanted to prove the fact that the desert is the ideal place to meditate and shrink into one's shell.